I’m not going to spend too much time writing about Canelés de Bordeaux, and going on-and-on about my first experience with them as a young 20-year-old traveling from Paris to Germany on the TGV train, and how my eyes almost exploded out of my head as did my tastebuds the moment I crunched into my first bite of canelés. Instead, I will say that if you have had canelés before and enjoy them as much as I do, you probably remember the first time you enjoyed this magic pastry from France. If you have not had a canelés experience, I suggest you book a flight to France, tour the Bordeaux region, and before you start out on wine tasting adventures start your day with canelés and coffee… tout de suite! Until then, and with my best efforts, my Canelés de Bordeaux recipe is yours. As for canelés molds, I used silicon molds and actually had great results. I found the best situation for me in achieving that crisp outer shell desired with canelés is to generously butter the inside of the molds with softened butter (not melted), coat the inside of them with sugar, then refrigerate until hard and set. Next, another important step is to allow the canelés batter to rest before baking, Some say at least an hour, some say 24 hours. I tried both. While waiting an hour before baking felt like I was rushing a delicate process, and waiting 24 hours felt I was being authentic, the flavor and texture of both were quite similar. I will say, whatever you choose to do as far as “wait times”, I would make sure your batter is close to room temperature as possible before baking. So if you choose to wait and refrigerate overnight, set the batter out on the counter for a time to allow it to “warm up” before baking. Alright, enough of that… Let’s get to it! Scalding the milk, cream, and butter... ready to temper to the flour, sugar, and eggs. Rum is optional... and highly recommended. Coating the inside with softened butter and sugar really creates that wonderful crispy outer shell. The day before or at least an hour before: to a heavy bottom sauce pot put in your milk, cream, butter, orange zest, and 1/4 cup of the sugar. Scald the milk just below a simmer.. do not boil. In a mixing bowl add your flour and remaining 1 cup of sugar. Stir to combine. Add the whole eggs and egg yolks along with the rum and vanilla. Mix like hell until you have achieved a smooth mixture. “Temper” the hot milk mixture into the egg mixture. A little at a time and mixing all the while, add the scalded milk to the egg mixture. Whisk Whisk Whisk as to not make scrambled eggs. Add all of the milk and whisk to a nice smooth batter. Now, at this point, you can cover the bowl and place it in the fridge to rest overnight. This really allows the gluten in the flour to relax, then temporary custard to chill, and the flavors to meld. If you just came in from dinner (and wine…lots of wine) with friends and wanting canelés ASAP like I did, allow the mixture to hang out at least 1 hour before baking. While you’re waiting for the batter to “chill”, brush the inside of your canelés molds with softened butter (not melted) generously. Then coat the inside of them with granulated sugar, knocking out the excess. Place the molds on a tray and pop in the fridge to set up and harden. 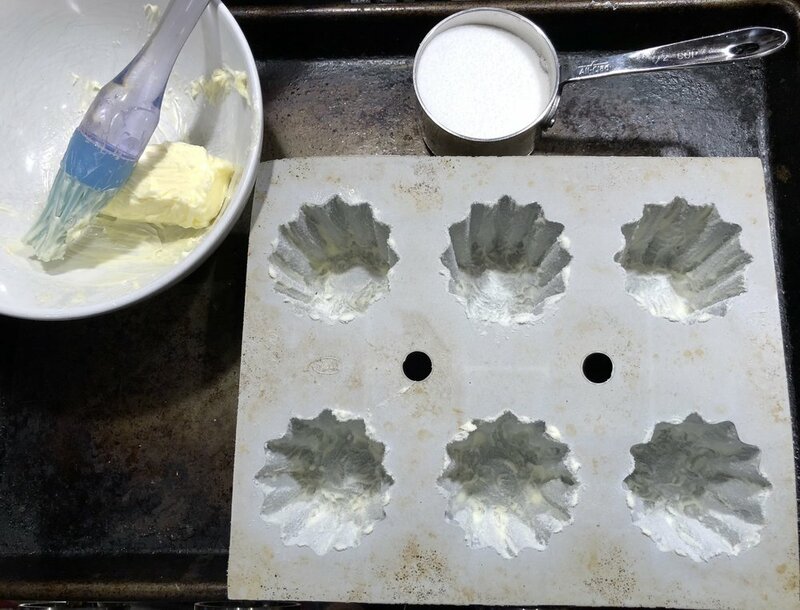 While not achieving the traditional Bees Wax coating used in authentic Canelés (yes traditionally bakers would coat the inside of molds with beeswax before baking) I found this softened butter and sugar method worked great for me. When ready to bake: Preheat your oven, conventional not convection with the fan, to 450 degrees, and set the batter out on the counter to “warm up a bit. Remove your molds from the fridge, keeping them on the baking tray. Pour the batter into the molds, filling the cup 3/4 full from the top. I even had some go to the top and they were fine baking. Bake the canelés for 30 minutes at 450 degrees. After the first 30 minutes, reduce the temp to 400 degrees and bake an additional 30 minutes. Remove the canelés from the oven and allow to cool completely in the molds. Flip the canelés out onto a clean surface. You may need to rim the inside with a paring knife or offset spatula if using traditional copper molds. They should be a dark caramelized brown with golden custard looking center. The outer shell should be hard and candied like a creme brûlée. To these, you can dust with powdered sugar, fill in the top with whipped cream, salted caramel, ganache, or my favorite…… with a side of espresso, a train’s view of the French countryside, and thoughts of never ever ending this experience. Enjoy!